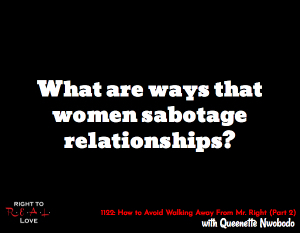 In this episode, Yahnathan continues his discussion with life strategist & counselor Queenette Nwobodo by addressing the question: What are ways that women sabotage relationships? What are ways that women sabotage relationships? The importance of genuine forgiveness. Signs that a woman may believe she is unlovable. How fear and abandonment can hinder women from moving forward with the right man. Ways that women sabotage relationships. Acknowledge that you need to heal your soul and truly believe that you are lovable. Examine your past relationships to determine whether or not you’ve ever sabotaged any potentially good relationships. If you have, ask the Most High to reveal to you what led you to sabotage those relationships. Pray and ask Yah to begin healing any soul wounds you may have.